Dwayne Aberhart with an even bigger rig shark caught surfcasting near Christchurch in December 2016. It weighed in at a massive 41 lbs. Congratulations Dwayne. I haven’t seen a rig shark that big before. 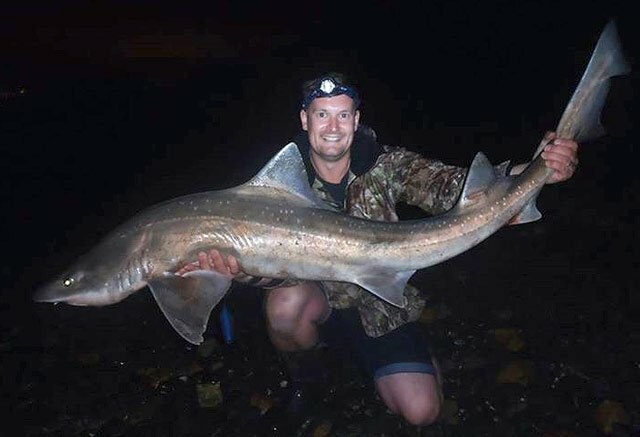 Rig – Mustelus lenticulatus, has numerous names including smoothhound, gummy shark and spotted dogfish. They are a very good fish to eat and reasonably strong fighters. Rig shark is usually sold in the shops as Lemon Fish. This is a prime species used in fish and chip shops. 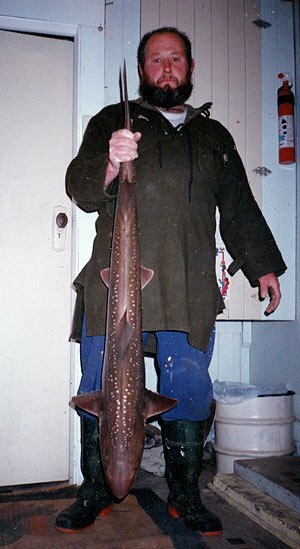 Johnny Richards, an expert surfcaster, with a very huge 17 lb rig shark caught at South Rakaia Beach. Johnny used crab for bait. Rig are generally brown in colour with numerous blue and white spots. 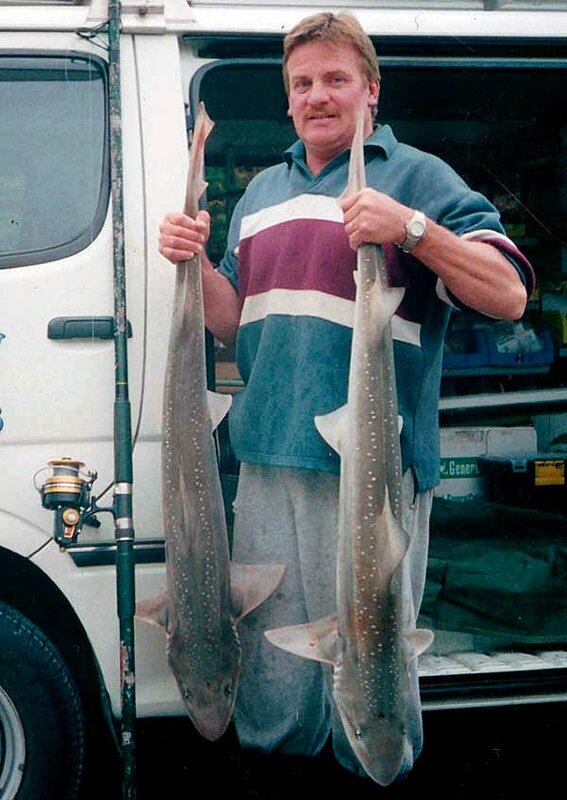 The colour is most striking when the shark is first caught but the colour soon fades to a dull greyish brown. Rig have no spines in their dorsal fins. The teeth are designed more for crushing crabs and shellfish rather than catching fish. This shark has an average length of 70 – 100 cm but a big one can measure close to 1.5 metres. The best bait for rig is any sort of crustacean, in particular, swimming crab and crayfish followed by tuatua or other shellfish. Anglers have also been successful surfcasting for rig with shrimps and prawns purchased at the supermarket (both cooked and uncooked). I have been assured that the very best bait for rig is rock lobster (crayfish) bodies. Surfcasters able to obtain a supply of crayfish bodies are at an advantage when it comes to rig fishing. Although rig can be caught sometimes on cut fish baits you are far more likely to be successful if you put the effort into catching a supply of crabs first. 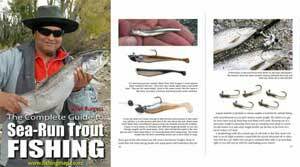 Although rig can be caught sometimes on cut fish baits they have flattened teeth more suited to grinding rather that catching fish. They feed on animals they find living on or under the seafloor. You are far more likely to be successful if you put the effort into catching a supply of crabs first. You can catch crabs by tossing a small crab pot into the sea behind the first wave when conditions are reasonably calm. Perhaps the quickest way to catch them is by lowering a bicycle wheel with a baited net stretched across it to the bottom. Use old fish heads and the like to bait the net. Lower it down then wait ten minutes or so before hauling it up quickly. The New Brighton Pier, in Christchurch, has been a popular place for this since it was first built. You can freeze crabs for later use as bait but fresh is best. Cut the crabs up to best fit your hooks depending on the size of the crab. Pull the shell off to increase the scent trail. Use plenty of elastic bait cotton to hold the crab on the hook. The best time to go surfcasting for rig shark is when the water is still a bit discoloured following a southerly blow. Rig are often caught very close to shore just behind the first breaker. Their first few runs can be quiet powerful. 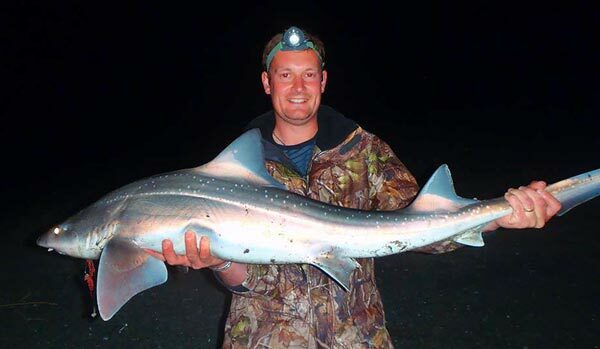 This species can get quite large with some having been caught in excess of 30kg. The best time to fish for them is in the evening and at night. Rig, or lemon fish, are excellent eating done in beer batter or bread crumbs. I find they are best headed and gutted straight away and then frozen as this gets rid of the ammonia smell from the flesh. Rig nets were a common sight along Canterbury beaches some twenty odd years ago but are not often seen nowadays. I believe this is a wasteful form of fishing. This is a seriously big rig. It is one of the biggest rig sharks we have ever seen! Ian with a good size rig shark from the surf at Birdlings Flat. Ian Robertson has caught another good fish while surfcasting at Birdlings Flat on 17 October 2011. 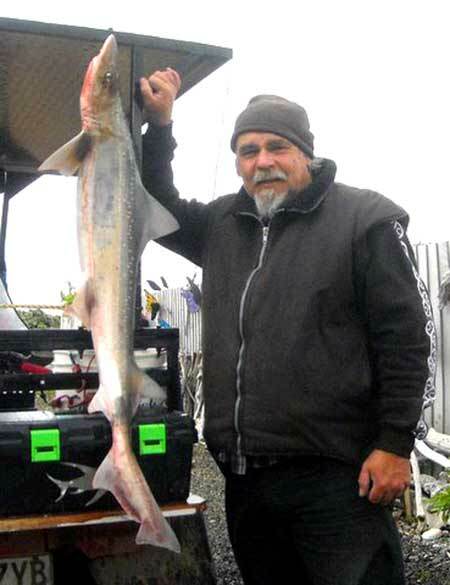 This time a rig shark – his second for the season. This species of shark are very good eating. Thanks Ian for sending us the picture. Rig shark can be hard to catch at times. Crab and crayfish make the best bait together with tuatua. The best time to fish for them is at the end of a southerly blow as the water is clearing.